Fiber-Optic Link Around the Globe (FLAG) is a 28,000 kilometres (17,400 miles; 15,120 nautical miles) long fibre optic mostly-submarine communications cable that connects the United Kingdom, Japan, India, and many places in between. The cable is operated by Global Cloud Xchange. The system runs from the eastern coast of North America to Japan. Its Europe-Asia segment was the fourth longest cable in the world in 2008. The Europe-Asia segment was laid by Cable & Wireless Marine in the mid-1990s, and was the subject of an article in Wired magazine in December 1996 by Neal Stephenson. The FLAG cable system was first placed into commercial service in late 1997. FLAG offered a speed of 10 Gbit/s, and uses synchronous digital hierarchy technology. It carries over 120,000 voice channels via 27,000 kilometres (16,780 miles; 14,580 nautical miles) of mostly undersea cable. FLAG uses erbium-doped fiber amplifiers, and was jointly supplied by AT&T Submarine Systems and KDD-Submarine Cable Systems. Its design, development, installation, and service conformed to ISO 9000 quality standards. FLAG provided a link between the European end of high-density transatlantic crossings and the Asian end of the transpacific crossings. FLAG includes undersea cable segments, and two terrestrial crossings. The segments can be either direct point-to-point links, or multipoint links, which are attained through branching units. At each cable landing point, a FLAG cable station is located. The total route length exceeds 27,000 kilometres (16,780 miles; 14,580 nautical miles), and comprises 1,020 kilometres (634 miles) of terrestrial crossings. Approximately 6,600 kilometres (4,100 miles; 3,560 nautical miles) of the submerged cable is buried 1 metre (3 feet 3 inches) below the sea bed. Cable burial was performed by either a submersible plough as the cable was laid, or jetting the laid cable into the sea bed via remotely operated vehicles (ROVs). Over several years, the route evolved as new branches and feeder systems were considered and realised. FLAG includes two terrestrial crossings, one in Egypt, and the other in Thailand. Each of these land crossings is totally duplicated on fully different routes. As a result, any fault within one route will cause automatic protection switching to the other route within a time period of less than 50 ms.
Like other global undersea networks, FLAG uses erbium-doped fibre amplifiers (EDFAs). EDFAs boost the optical signals instead of the optical/electrical conversion, which is generally used in regenerative technology. These optical amplifiers use short, gain-specific lengths of fibre which are doped with erbium ions, and spliced in-line with the transmission fibre. The signal power is amplified by pumping the erbium-doped fibre (EDF) with 1,480 nm laser light which is attached through an optical coupler. The majority of the repeater components are passive. These include EDF, fused-fibre optical couplers and optical isolators. Active components include laser pump assemblies, and associated controls. The total number of components within the repeater is lesser than that of regenerative systems. The route between Alexandria and Cairo is 223 kilometres (139 miles) long, and hence requires remote pumping in order to meet performance requirements. Remotely pumped amplifiers can be regarded as repeaters without active modules. This technology comprises short lengths of EDF spliced into the land cable. The erbium-doped sections are situated within the cable span, and are pumped by 1,480 nm pump lasers which are based at the station. FLAG Europe Asia (FEA) was the first segment opened for commercial use on 22 November 1997. The FLAG Atlantic 1 (FA-1) segment became operational in June 2001. It was constructed as a joint venture between a FLAG Atlantic subsidiary of the parent company FLAG Telecom Holdings, and GTS Transatlantic. Alcatel Submarine Networks laid the undersea portion, and the entire cost was estimated at $1.1 billion. In March 2013, an upgrade for the southerly link was announced to up to 100 Gbit/s, with equipment from Ciena. In 2006, Kenya Data Networks announced plans for a spur from Yemen to Mombasa. West of Mumbai, FLAG has a capacity of 80 Gbit/s. The segment between Lantau, Hong Kong, and Busan, South Korea was broken by the 2006 Hengchun earthquake. The 2006 Hengchun earthquake on 26 December 2006, off the southwest coast of Taiwan, disrupted internet services in Asia, affecting many Asian countries. Financial transactions, particularly in the foreign exchange market were seriously affected as well. The disruption was caused by damage to several submarine communications cables. On 30 January 2008, internet services were widely disrupted in the Middle East and in the Indian subcontinent following damage to the SEA-ME-WE 4 and FLAG cables in the Mediterranean Sea. BBC News Online reported 70% disruption in Egypt and 60% disruption in India. Problems were reported in Bahrain, Bangladesh, Kuwait, Pakistan, Qatar, Saudi Arabia, and United Arab Emirates. The respective contributions of the two cable systems to this blackout is unclear. Network outage graphs suggest that the two breaks occurred at 04:30 and 08:00 UTC. The cause of the damage was not declared by either cable operator, but news sources speculated the damage was caused by a ship's anchor near Alexandria. According to the Agence France-Presse, the Kuwaiti government attributed the breaks to "weather conditions and maritime traffic". The New York Times reported that the damage occurred to the two systems separately near Alexandria and near Marseilles. Egypt knew of "no passing ships" near Alexandria which has restricted waters. One day later, on 1 February 2008, the FALCON cable was also reported cut 56 kilometres (35 miles; 30 nautical miles) off Dubai. The first of two repair ships was in place by 5 February. On 19 December 2008, internet services were widely disrupted in the Middle East, and in the Indian subcontinent, following damage to the SEA-ME-WE 4, SEA-ME-WE 3, and FLAG FEA cables in the Mediterranean Sea. It is not known what has caused these multiple breaks, however, there was seismic activity in the Malta area shortly before the breaks were identified, although it is thought that the damage may be due to a ship's anchor or trawler net. According to FEA Cable System of Reliance Globalcom, the failure lay between Alexandria and Palermo. Reliance Globalcom completed the repair on the FLAG EUROPE ASIA (FEA) cable on 29 December 2008, at 14:15 GMT. Customer services that were affected due to the cable cut have been restored back normal with the completion of repairs. Damage to FNAL caused by Typhoon Morakot was reported as affecting internet traffic to China on 18 August 2009. In 2014, it was revealed that Skewjack was the location of the Government Communications Headquarters (GCHQ) interception point on the Reliance Communications international fibre link, copying data to GCHQ Bude, as part of GCHQ's Mastering the Internet project. ^ a b Neal Stephenson (December 1996). "Mother Earth Mother Board". Wired (4.12). Retrieved 5 October 2013. ^ "The internet's undersea world". The Guardian. 1 February 2008. Retrieved 16 October 2017. ^ a b c FLAG Telecom Holdings (16 May 2000). "Prospectus". US Securities and Exchange Commission. Retrieved 6 October 2013. ^ a b c d e f Welsh, Thomas; Smith, Roger; Azami, Haruo; Chrisner, Raymond (February 1996). "The FLAG cable system". IEEE Communications Magazine. 34 (2): 30–35. doi:10.1109/35.481241. ^ "Fibre Loop Across Globe" (PDF). Promotional slides. FLAG Telecom. 28 December 2006. Archived from the original (PDF) on 17 March 2007. Retrieved 5 October 2013. ^ Coverage map > cable systems > FEA Archived 22 March 2014 at the Wayback Machine, Reliance Globalcom. Retrieved 15 March 2014. ^ "FLAG Atlantic-1 enters commercial service" Archived 16 March 2014 at the Wayback Machine, FLAG Telecom, 15 June 2001. Retrieved 15 March 2014. ^ "Coverage map > cable systems > FA-1" Archived 22 March 2014 at the Wayback Machine, Reliance Globalcom. Retrieved 15 March 2014. ^ "Reliance Globalcom upgrades Trans-Atlantic FA-1 south submarine network to 100G with Ciena's GeoMesh". Press release. Ciena. 14 March 2013. Retrieved 6 October 2013. ^ "History: 2006" Archived 26 March 2014 at the Wayback Machine, Reliance Globalcom. Retrieved 15 March 2014. ^ a b "Coverage map > cable systems > FALCON", Reliance Globalcom. Retrieved 15 March 2014. ^ "FALCON", FLAG Telecom. Retrieved 15 March 2014. ^ "KDN pips EASSY to the post". MyBroadband.co.za. 25 June 2006. Retrieved 5 October 2013. ^ "Flag North Asian Loop extends service into Korea and Japan", Submarine Cable Networks, 21 May 2002. Retrieved 15 March 2014. ^ "Coverage map > cable systems > FNAL" Archived 22 March 2014 at the Wayback Machine, Reliance Globalcom. Retrieved 15 March 2014. ^ "網上銀行服務仍「斷纜」". Singtao Daily (星島日報). Archived from the original on 5 November 2013. Retrieved 5 November 2013. ^ "Internet failure hits two continents". CNN.com. CNN. Archived from the original on 3 February 2008. ^ a b "Severed cables disrupt internet". news.BBC.co.uk. BBC News. 31 January 2008. Retrieved 31 January 2008. ^ The Associated Press via nytimes.com (1 February 2008). "Cable break causes wide internet outage". The New York Times. Retrieved 1 February 2008. ^ Zmijewski, Earl (30 January 2008). "Mediterranean cable break". Renesys blog. Renesys. Archived from the original on 3 February 2008. Retrieved 31 January 2008. ^ "Cable damage hits internet connectivity". TimesOfIndia.IndiaTimes.com. The Times of India. 31 January 2008. Retrieved 31 January 2008. ^ "Indian outsourcing sector hit by internet disruption". AFP. 31 January 2008. Archived from the original on 3 February 2008. Retrieved 31 January 2008. ^ Timmons, Heather (31 January 2008). "2 communication cables in the mediterranean are cut". The New York Times. ISSN 0362-4331. Retrieved 31 January 2008. ^ Brauer, David (4 February 2008). "High-tech mystery: are terrorists behind recent internet disruptions?". MinnPost.com. MinnPost. Retrieved 4 February 2008. ^ "Update on submarine cable cut". Daily Bulletin. Flag Telecom. 6 February 2008. Archived from the original on 19 February 2008. Retrieved 5 October 2013. ^ "Third undersea internet cable cut in mideast". CNN. 1 February 2008. Retrieved 2 May 2010. ^ "Work begins to repair severed net". news.BBC.co.uk. BBC News. 5 February 2008. Retrieved 5 October 2013. ^ a b "Severed cable disrupts net access". news.BBC.co.uk. BBC News. 19 December 2008. Retrieved 21 December 2008. ^ "Third subsea cable repairs begin". news.BBC.co.uk. BBC News. 23 December 2008. Retrieved 27 December 2008. ^ "Reliance Globalcom cable update page". Archived from the original on 3 January 2009. Retrieved 30 December 2008. 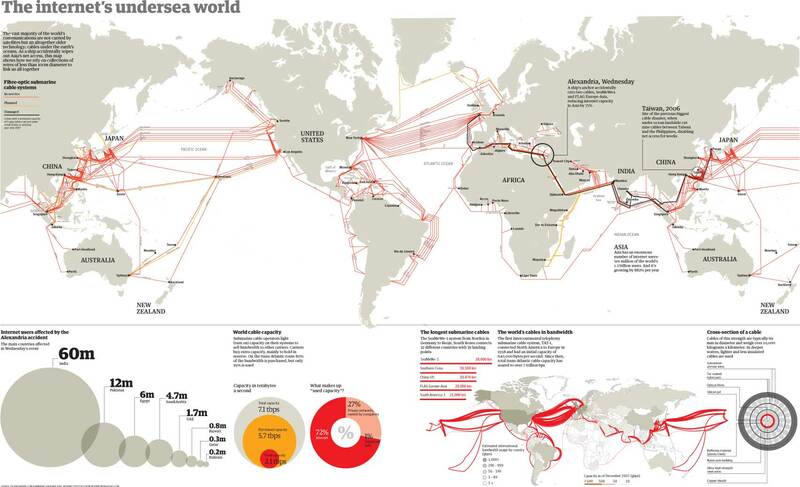 ^ "Damage to undersea cables disrupts int'l telecom services". Xinhua. 18 August 2009. Retrieved 5 October 2013. ^ Geoff white (20 November 2014). "Spy cable revealed: how telecoms firm worked with GCHQ". Channel4.com. London: Channel 4 News. Retrieved 22 November 2014. ^ "INCENSER, or how NSA and GCHQ are tapping internet cables". The Netherlands: Top Level Communications. 30 November 2014. Retrieved 30 November 2014. ^ Darren Pauli (21 November 2014). "GCHQ and Cable and Wireless teamed as Masters of the Internet". TheRegister.co.uk. The Register. Retrieved 22 November 2014.